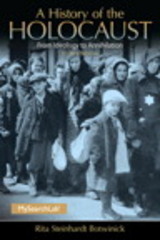 A History of the Holocaust 5 Edition Examines the causes of the Holocaust and the people involved. Told with scrupulous attention to detail and accuracy, this text provides important background information on Jewish life in Europe, the functions of the hierarchy within the Nazi government, and the psychological foundations of prejudice. Unlike other texts on the subject, A History of the Holocaust gives students an idea of just who the victims of the Holocaust were. In fact, the author tells this story from a unique point-of-view, having experienced Nazi Germany as a child. Learning Goals Upon completing this book readers will be able to: Describe the sequence of events that led to the Holocaust Understand the people that were victims of the Holocaust and the ways they responded to the events as they unfolded Draw their own conclusions about controversial topics related to the Holocaust Note: MySearchLab does not come automatically packaged with this text. To purchase MySearchLab, please visit: www.mysearchlab.com.